It time to s'mores some more's with our Marshmallow Tree. This whimsical design allows you to roast 10 yummy marshmallows at once, perfect for sharing and making friends! True to our spirit Wildwood brings you products to enhance the wood fired cooking experience, our Marshmallow Tree is a perfect example. This cool tool makes it fun and easy to roast marshmallows. We must say that this is another must have item for the wood fired oven toy chest. Break this out after dinner and watch as adults become kids and the kids become kids! Creating lasting memories and bonding with family and friends is what cooking with the wood fired oven does, and it is the simple fun things people will remember and cherish. Our marshmallow tree is just another piece of the puzzle, making this happen. Our marshmallow tree is not only great for use with our wood fired oven, but also great for roasting marshmallows in the fireplace or over a campfire. 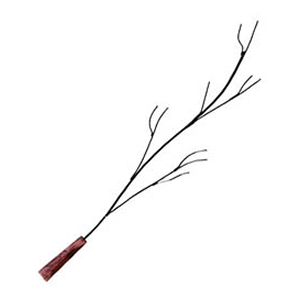 The tree has an attractive wood handle and measures 44″ in length, which will give you ample distance from the fire to toast without roasting!